Read here about an outreach program that teaches school children to build tensegrity structures. RIMOSA, the Rhode Island Museum of Science and Art, offers a structured outreach program geared to the needs of school students in grades 3-12. In the program, students create their own tensegrity sculptures out of every day materials using Fuller as inspiration. 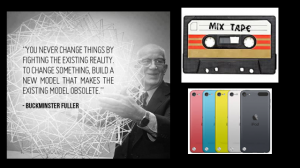 The program includes information on the art and innovation of Buckminster Fuller. The program of one 45-60 minute program in 2014 was listed as $150, with discounts for multiple programs. The Tensegrity Sculptures Outreach Program icon, Rhode Island Museum of Art image." This page was last edited on 20 January 2019, at 12:44.